1) Do you put up lights? Why or why not? 2) What do you like and dislike in other people's light displays? What are your favorite colors of lights? 3) Do you drive around and look at lights at this time of the year? BTW, the title of this topic is in honor of my younger son. When he was about three and we were driving at night around the holidays, he would see some fancy light display and cry out to his older brother, "Lights, [name of older son], lights!" My family has always put Christmas lights up. I can't ever remember a time that we didn't. I hate the big inflatable monstrosities that everyone seems to put up. I like multicolor smaller lights, however, the white ones are pretty too. Absofuckinluely! I try to take pics of the really tacky ones! Our house only recently has outside outlets. In the past, we had an extension cord that ran through one of the windows, to the front porch. I prefer the smaller lights, in multi color. Or all blue. I love blue lights, but they are darker. 1) Do you put up lights? Why or why not? Living in a high-rise condo, I feel I don't have a place for outdoor lights, though in the past I have noticed that some of my neighbors have put lights on their balcony railings. My dad still puts up outdoor lights at his house. 2) What do you like and dislike in other people's light displays? What are your favorite colors of lights? I don't much care for those light-up plastic figures, regardless of whether the figures are Santas, snowmen, manger scenes, carolers, or whatever. I also don't like to see too much stuff crammed into a front yard display. During the energy crisis of the 1970s when displays went minimalist, I really developed a liking for plain white lights. I like the icicle lights, too. 3) Do you drive around and look at lights at this time of the year? Sometimes. 4) How do you plug the outside ones in? (I've always wondered about this because some of my homes have not had outdoor outlets.) Well, my dad used to have this plug-thingy. I don't know what it was properly called, but you could screw it into the front porch light socket instead of a bulb, and it had electrical outlets where you could plug in the lights. It was a way of temporarily turning an outdoor light fixture into an electrical outlet. 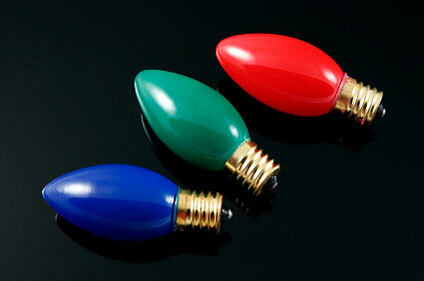 5) Do you like those big old-fashioned bulbs? (I noticed HerrKaiser mentioned that he does, in the Christmas quiz, and I do too.) I do have a residual fondness for those big outdoor lights. That's what my dad used to decorate when I was a small boy, before the energy crisis and the invention or popularity of the minilights. I also fondly remember their smaller cousins that you used on the indoor Christmas tree. I think one type of bulb was called a C-3 and the other a C-7, but I can never remember which was which. I love blue lights, too! Though I've wondered if those signify Hanukkah. If so, I may have to start celebrating Hanukkah instead, because I way prefer them to red and green. Another thing I've noticed more this year is lights in a more limited palette of blue and green with a few reds -- but no yellow, orange or white. I find that color combination really striking. I also like just blue and green, or just blue and purple, or a couple of different shades of purple (that must be Prince's house). There's this house near here that has those icicle lights hanging from the top of the front porch -- except instead of the usual white ones, these are beautiful cobalt blue. Then on the bushes below, there's a sprinkling of the limited-palette blue/green/red lights. It's beautiful. There's another one nearby that has a single tree heavily outlined in that limited palette. Also really nice. 1) Like everybody else, apparently, except the people who have them, I hate those huge plastic or inflatable figures. They're sort of the decor equivalent of corny Christmas letters. 2) I used to really like the all-white look, but I think it's been overdone. I did see one all-white house I thought was pretty original because, it emphasized different textures: icicles and regular lights and little snowflake-shaped lights, strategically placed. 3) I think in general I prefer outdoor displays that are a bit underplayed to those that go way overboard. But those way overboard ones are undeniably riveting. Anybody know how much that kind of thing adds to the electricity bill? Do you feel it's frowned upon in these environmentally-conscious days? What if you went way overboard -- but used all green lights? 4) In lights strung on deciduous trees, I much prefer the ones that follow the outlines of the trunk and branches rather than those that are strung horizontally from branch to branch. 5) For tree lights, I'm kind of sick of those ordinary little lights you get at Walgreen's or Target, but they're so cheap and readily available they're hard to resist. BTW, the questions above are meant as a guideline or jumping off point. You're welcome to answer them individually, but this isn't a survey format, so don't feel obliged to follow them exactly. BTW, anybody know where a goy can get a little menorah? I used to really like the all-white look, but I think it's been overdone. I did see one all-white house I thought was pretty original because, it emphasized different textures: icicles and regular lights and little snowflake-shaped lights, strategically placed. Have to admit I'm far from tired of it. My "ideal" is a house with white icicle lights on the gables and eaves, the shrubbery wrapped in white lights, and single white candles in each window. For tree lights, I'm kind of sick of those ordinary little lights you get at Walgreen's or Target, but they're so cheap and readily available they're hard to resist. Heh, those light sets are so cheap you can practically buy them new every year and throw 'em away after the holidays. I love lights. So yes, I do. I have a small set outdoors nd lots on my tree and a set draped across my coffee table. Plain white,not sparkling just on all the time. Lovely! I don't think outdoor outlightd are common at all here. In fat I know noone with outside power. For the small set of lights, the wire fits under the front door. I dont even know what you mean here? Pictures? the smaller lights (sometimes known as "twikle lights") are in a strand, and are already in the "sockets" when you get them and plug them in, very small lights. The "old fashioned" Christmas lights are colored bulbs you have to twist into sockets, are are usually the size of a "night light" often used in a child's bedroom. I just spent half the morning trying to untangle the Christmas tree lights! It's a mystery since every year I cut out rectangles of cardboard from cereal boxes and careful wind the lights around them when I'm taking them off the tree. But then, in early December when I go to unpack them again, they've all gone together into a tangle! What causes this?? 'Nother thing...before you go to all the trouble to untangle your lights, you might try finding their ends, plugging them in, and see if they work!! I just spent half the morning trying to untangle the Christmas tree lights! In a disquieting way, did everything seem mixed? I bought outdoor lights this year for the first time and am attempting to string them on some bushes out front. It's complicated. I know I won't achieve an effect anything like what I see in some houses that I really like. For example, I particularly like one house near here that entirely covers one pretty tree out front in lights, with every branch individually defined. It's so beautiful I will drive or even walk out of my way to go past it. Last night I went by there with my dog, and we ran into the woman who lives there. She told me her husband applies the lights, and is extremely particular about them. I can't duplicate that, because I am neither extremely particular nor even moderately skilled. But I think Christmas lights is an area where you just do your best, then appreciate your own efforts for whatever they are while also enjoying the work of others. It's part of the wonderful magic of Christmas . More concrete: must be the X-Mas goblin, brother of the just as famous missing-socks-goblin, first cousin of the dust bunnies goblin and godfather of the "I didn't break that" goblin. Happy untangling! Just think of them lights as Chilean and Aguirrie's lights . Gottas smile about that one. It's the same with me and the small window lights. Other people have them all neat in exact rows, while mine just dangle higgeldy-piggeldy, somewhere near the window frame. I tried with sticky tape, I even bought specific vacuum cups to fix them - and one year I gave up. Now I just twine them somehow around the window and am done in five minutes. Problem solved . To me, mine are still the most beautiful window lights, because the room behind them is my home. A good solution, and a nice message! LOL about the tangled lights. My parents finally bought a nice, pre-lit tree this year to avoid the tangled light issue... at least where the main Christmas tree is concerned. Dealing with the lights is always my Dad's job, and this year he'd had enough. We put the tree up when I was home over Thanksgiving, and I have to say it was great... it was significantly less stressful. But, we also have a few smaller trees here and there in the house and some lights on garlanding, outside, etc. So, for those extra decorations he still needs to confront the loose light strings. For example, I particularly like one house near here that entirely covers one pretty tree out front in lights, with every branch individually defined. It's so beautiful I will drive or even walk out of my way to go past it. Last night I went by there with my dog, and we ran into the woman who lives there. She told me her husband applies the lights, and is extremely particular about them. I can't duplicate that, because I am neither extremely particular nor even moderately skilled. But I think Christmas lights is an area where you just do your best, then appreciate your own efforts for whatever they are while also enjoying the work of others. I always wonder how they do that. It's such a beautiful effect. I would never have the patience. And how do they figure out how many strings of lights they need? I know! I kind of wished I'd asked the woman even more about it, but she was just coming in from work and anyway she said her husband did it all. But what she did tell me was that every year they have to get more and more lights, as the tree grows. Her husband is frustrated because they ran out of lights and had to leave some branches uncovered. She said they bought them at Costco, which was now out of them. I mentioned that I'd seen some at a local garden store for 20% off, and she said she'd seen those, too, but that the strings weren't long enough -- they need strings of 100 or so or they'd have to hook too many together per branch. It looks like he must run the lights along the branches and then meticulously tie them on every few inches, maybe with wire or sumpn. Plus, he'd have to do most of it on a ladder. I would guess the tree is at least 15 feet high. One of these nights I'll try to sneak by and get a picture to post here. I tried to find one similar on the internet, but I can't figure out what to google to call up photos of this particular kind of effect. I had decided to put up lights outside for the first time this year. I thought about getting an extra christmas tree an put it close to the front door and put some nice lights in it. Nothing too fancy, just plain white lights. I was going to get them this weekend and this morning there was an article in the newspaper quoting a report that one third of all outdoor lights were actually unsafe and a fire hazard! I think I'm going to reconsider. The article unfortunately didn't say which kinds or brands of lights were safe. Do you leave your lights on all night? Is that safe to do or should you unplug them after a certain time? FWIW, my dad always turns his outdoor lights off when he goes to bed at night. I just wanted to ask for a pic, because I can't quite visualize the effect (now, where have I read a similar sentence a few mins ago? ). 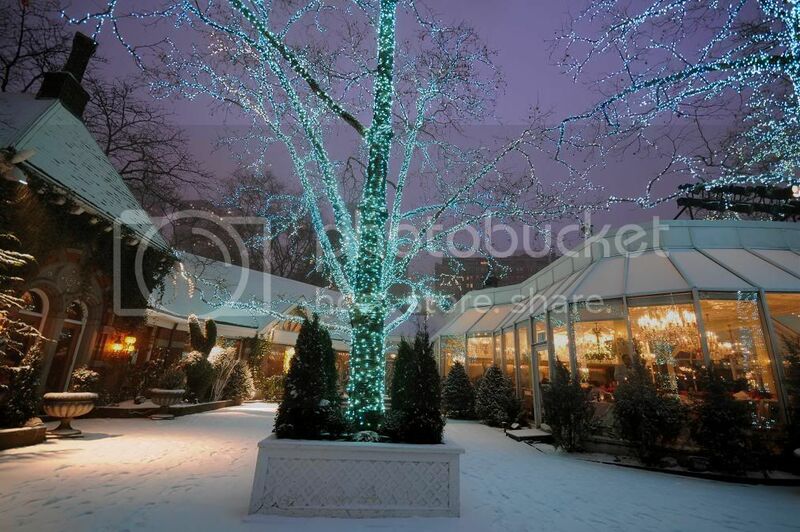 Yes, the one I'm talking about is similar, except that the tree isn't that tall, and has more lower branches. And the lights are multi-colored, but with emphasis on the blue/purple side. It might be a crab apple or azalea tree, so the branches kind of spray out like a firework going off. I remember first hearing about this effect from my step-mother, who talked about the Tavern on the Green ones as looking really nice. I think most people turn them off at night, but I've seen people leave them on all night. If you want, you can find a timer that you can plug your lights into, and it will automatcially turn them on and off at the times you program into it. yeah i use a timer to get my lights to come on from 6am-8.30 am and then 5.30pm to midnight. Thanks for the advice. I'm going shopping tomorrow, lights and timer. We haven't decided when we'll get the trees this year. Sinterklaas (=the original Santa Claus) still has to come and bring chocolates and lots of other goodies (that's on December 6th) and it's traditional to wait untill after. Don't forget to leave a treat for his horse. Nikolaus/Sinterklaas coming on a horse? That thought is outright revolutionary . Santa Clause is different though. Much greater distances in the US. It's clear he needs some kind of transportation, be it a horse or a sled with reindeers. Well, he arrives in the Netherlands and Belgium on a steam boat from Spain of course. But once he's here, he normally travels on his white horse. But it seems this horse had a low startle point. Oops! Sinter Klaas landed on his hinter paws. Wonder if his harmonica broke in two....? Well, when it comes to Sinterklaas, the word is 'as long as he doesn't have to sing'. 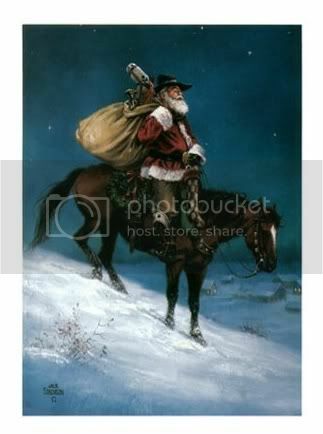 Ok, I change my previous statement to: Nikolaus coming on a horse? That thought is outright revolutionary . I bought the kid's presents for Nikolaus today. Gotta get some sweets tomorrow. And now I'm off to wrap the stuff. Are you already done with the preperations? I bought the present (a WII game console) a while ago and the kids are already playing with it. 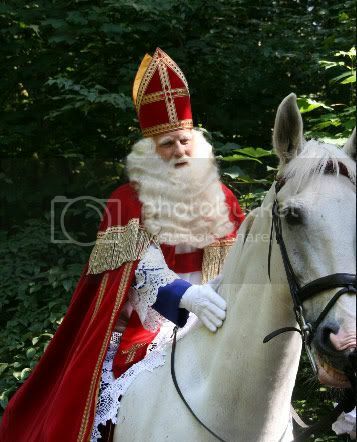 I know that's not the way to do it, but my olderst daughter informed me that the pre-christmas exams start on monday so of course, if I Sinterklaas waited until December 6th, there would be no time to play. Yeah, she's a clever one. So no more presents on sunday morning, just sweets, chocolate, marzipan and tangerines. 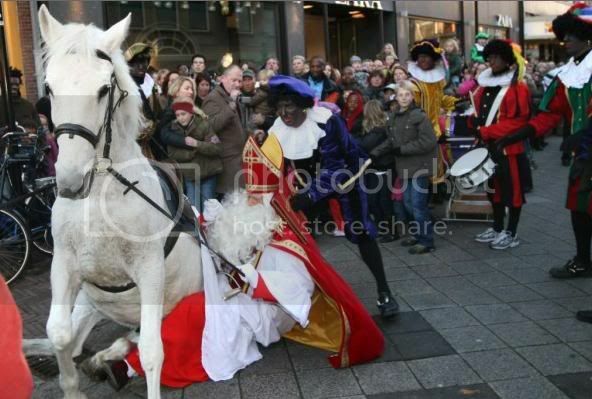 Looks like this Sinterklaas traveled with a whole crew of Black Piets instead of just one. When my children were young, they would always write letters of welcome for Santa. We would set a special twig table in front of the fireplace with a glass of milk, cookies, and carrots with ferny green tops for the reindeer. And the letters. Then, in the dead of night, my husband and I would perform a ritual. We would scatter a scoopful of ashes from the fireplace on the Oriental rug and then he would place his big hiking boots in it, making tracks. Then we would drink the milk (him), eat the cookies, and nibble on the carrots. We would write a return note from Santa on the bottom of the Christmas letters. Then we would proceed to fill up the stockings and put the remaining presents under the tree. You know Friend, as we speak, my daughter are preparing their special letter to Sinterklaas. Making a drawing and preparing to 'place their shoe' as we call it. One of their shoes is put near the fire place and filled with the letter. A carrot is placed next to the shoe, for the horse of course. No milk, though, over here Sinterklaas' helper 'Black Pete' as we call him, prefers a beer! The letter and the carrot will all have magically dissapeared. And the beer will be empty. All in exchange for lots of chocolate and goodies. And back on topic: I bought my outdoor lights today, with timer. Yay! We decided to buy the trees next weekend. Aww, that's sweet (both). And so alike, with the carrots and letters . No letters or anything for Nikolaus here. The kids just put their boots in front of the door. Normally they have to shine them beforehand, but not this year because we're running late. My youngest has a special mail connection to Santa Clause though. One year he started to cut out toys he wanted to have from catalogues etc, and put them into our own mailbox. Low and behold, the next morning they were gone. Santa had come over night had collected his wishes. Santa even comes in the middle of August to our house and collects Christmas wishes . Then, in the dead of night, my husband and I would perform a ritual. We would scatter a scoopful of ashes from the fireplace on the Oriental rug and then he would place his big hiking boots in it, making tracks. Then we would drink the milk (him), eat the cookies, and nibble on the carrots. We would write a return note from Santa on the bottom of the Christmas letters. Then we would proceed to fill up the stockings and put the remaining presents under the tree. In my family, I always did that kind of stuff myself, alone, exhausted, at 2 a.m., after returning from my husband's family's Christmas Even gathering, while my husband and the kids slept. Which I guess helps explain why I'm divorced. Hi Amanda, Im glad you had a stress free THanksgiving with your family. About the pre lit tree. We've had one for a few years and I hate it. The lights actually only worked for the first couple Christmas' Now we have to string lights on it anyway. Hope their tree's lights lasts longer than ours did. idk maybe they make them better these days. Hope so for them. Click to see the wonderful Christmas train in Montreal! Jeff Wrangler, thinking of you. My lights have been up since the day after Thanksgiving.